This is at 9 weeks 6 days and as soon as we saw the picture on the screen we both just laughed and I think we laughed through the whole ultrasound! Comments for Our little surprises! Are your twins identical or fraternal? My sonogram picture looks almost just like yours with two sacks and the obvious membrane - just wondering! We don't know our genders yet (only 12 weeks), Thanks and have so much for with your little twins!! 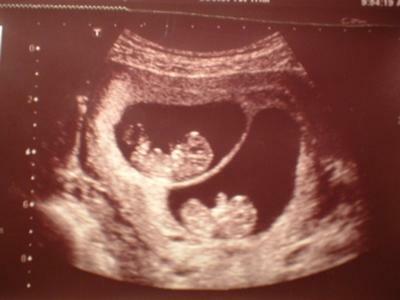 I know what you mean I laughed through my ultra sound also when we seen the 2 heads!! It is such a wonderful blessing and awesome experience!! I am now 34 wks through the pregnancy and waiting unpatiently counting the months!! Very surprising to find out your epecting twins! !